The 'Tamang Heritage Trail' is an exciting new trekking route located between Langtang and the Ganesh Himal. A culturally rich region steeped in Tibetan tradition, the local Tamang people are some of the warmest and most welcoming people. You ascend the road north towards the Tibetan borderlands and enjoy a relatively gentle circuit trek through picturesque villages, terraced fields, and peaceful valleys where only the most discerning trekkers go. Enroute, You will enjoy panoramic mountain views of the nearby peaks and soak in the natural hot springs at Tatopani. Continuing north towards Tibet we soak up the heritage and appreciate a local fort, monastery and exquisite local architecture of the Tamang homes. Day 01Kathmandu to Syabrubesi, drive approx. 6-7 hrsWe drive north from Kathmandu to Syabu Besi, where we will make our first night and final preparations for our trek. 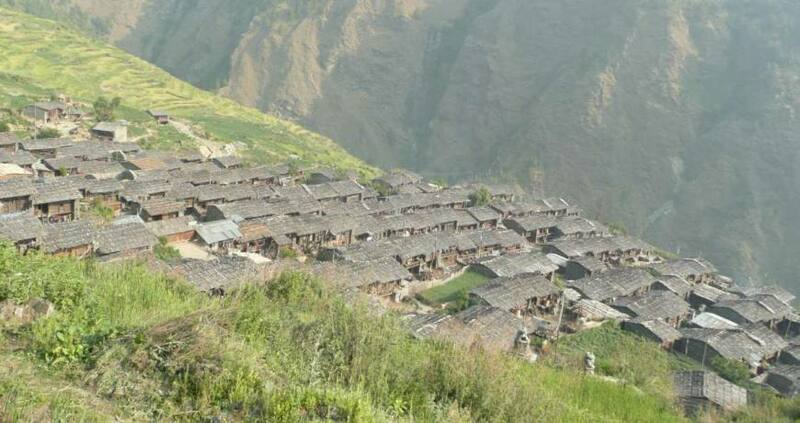 Developed by the Tourism for Rural Poverty Alleviation Program, the "Tamang Heritage Trail" is newly developed and an off the beaten track experience, which highlights an ancient lifestyle combining it with picturesque scenery and healing baths in natural hot springs. This is a superb introduction to trekking in Nepal among some of the most beautiful scenery in the whole country and characterised by the rich Tamang culture. This area is connected to Tibet and the trails in this region were used by traders from Tibet bartering in salt and mountain goats for meat (changra) with foodstuffs from the south. The people of this region are mostly Tibetans who came from Kerung in Tibet across the border and settled in Nepal. In earlier days, the citizenship of Nepal would not be offered to real Tibetans, so they changed their ethnicity to Tamang, which is what they still write till date. The culture and traditions of these people are similar to Tibet just across the border. During this trek along unbeaten trails and offering a total wilderness experience you will explore traditional Tamang villages, unspoiled and virtually untouched culture, life, crafts and nature. You will receive a warm welcome by the locals rich in their distinct colorful costumes, their houses adorned with beautiful woodcarvings. This region offers a wilderness experience with beautiful landscapes of alpine terrain, flat meadows and rhododendron forests. There are still bears, leopards, red panda and musk deer. During the months of March and April the Rhododendron forests are in full bloom and have many different species of trees, birds and butterflies. Day 02Trek to Gatlang (2238m). Walk approx. 5-6 hrsAfter two to three hours of ascent from Syabrubesi we reach a view point Bahundanda where we gain fantastic views of the Ganesh Himal, Gosainkunda range and Langtang Lirung. We head down to Goljung valley (lunch stop) which is an hour walking down hill from our view point. Today we walk through many villages and along the trails there are numerous Buddhist chortens and mani walls. Gatlang is a beautiful Tamang village that is set high on a hillside among terraced fields. Day 03To Tatopani (2607m). Walk approx. 5-6 hrsOur walk today begins by descending to Thangbuchet (near Chilime village) by the Bhotekoshi River. Chilime Hydropower dam is situated here. After Chilime, we start to ascend first by crossing a small hanging bridge and continue until we reach our Hotel. Enroute, we have excellent vies of the Langtang Range and Ganesh Himal. Tatopani literally means 'hot water', where one can cleanse in the natural hot springs. Locals believe that the waters have a healing quality that eases away your aches and pains. Day 05Trek to Timure & Tibetan borderlands. Walk approx. 3-4 hrsWe begin with an easy flat trails which descends to Timure en route to the old trade route to Tibet. After lunch, we head towards Rasuwa Gadhi, an historical reminder of the Nepal-Tibet relations that has existed for many centuries. A suspension bridge here links Nepal and Tibet. We are not permitted to go across at Rasuwa Gadhi, as it lies on the border and security is extremely tight. Day 06Return trek to Kathmandu. Drive 6-7 HoursWe drive and follow the Bhote Kosi River on the right side of the valley towards syaprubesi and ascending towards the Dhunche and continue drive to Kathmandu.